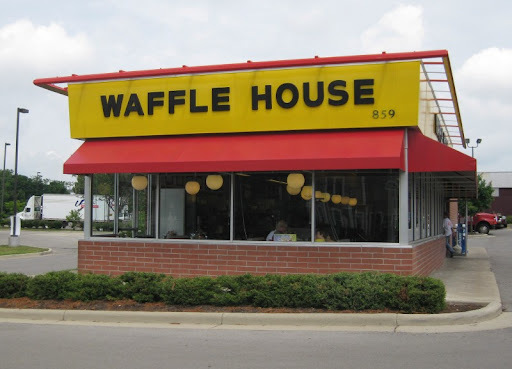 It is hard to get through a 6 week road trip across the Southern United States with just one post on Waffle House. So here is a second one - but this time we actually went inside. 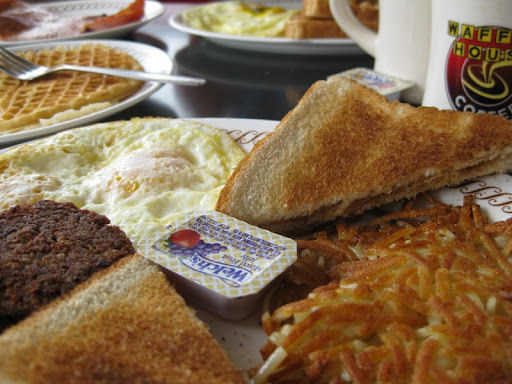 We were in Lexignton, Kentucky (getting ready to plough through bourbon country) and we needed breakfast. 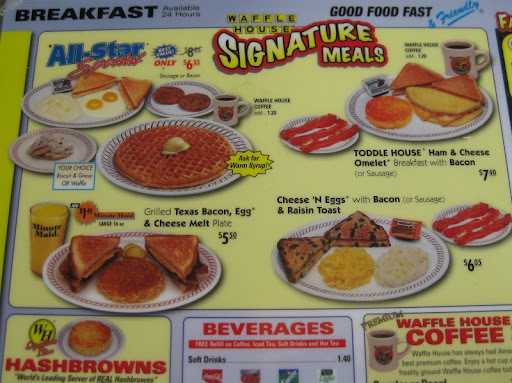 There was a Waffle House virtually in our hotel parking lot. Fate had come calling and would not be denied. First up, a waffle - not great, but edible. 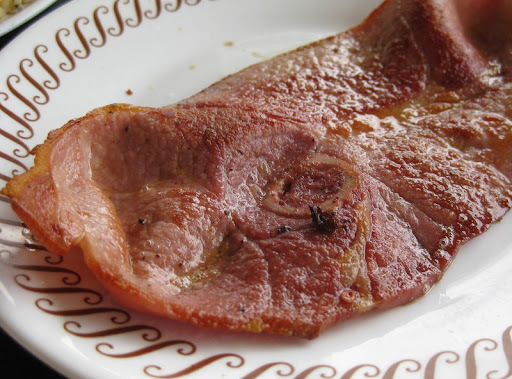 The country ham, on the other hand, was actually pretty good. As was pretty much everything else we had (although the "smothered" hash browns were a bit disappointing, with just a few onions scattered underneath). 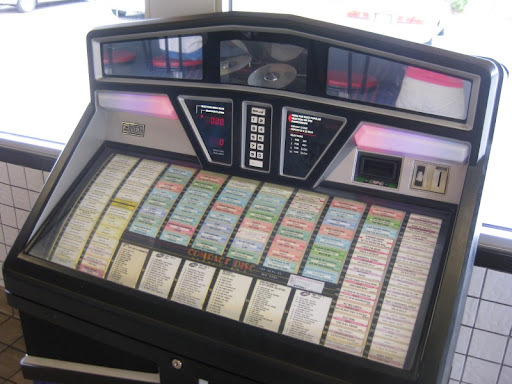 As advertised, they had the jukebox complete with the left column of songs all about Waffle House. Bellies full and Waffle House virgins no more (although does it count if you go before midnight? ), we hopped in the car and headed out in search of bourbon. 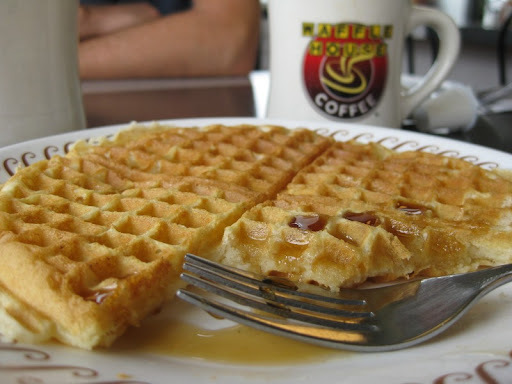 Then, Waffle House at 3 AM... perfect. You can't just get "smothered." You got to get it, in the words of Wiki, "scattered" (spread on the grill), "smothered" (with onions), "covered" (with cheese), "chunked" (with diced ham), "diced" (with diced tomatoes), "peppered" (with jalapeño peppers), "capped" (with mushrooms), "topped" (with chili). Just kidding with you a bit. Glad you tried it. It really is a late night place. Great hearing about your wonderful trip. Thanks for sharing your experiences. Matt - I promise we'll do it right the next time!